In March, we received our first specific hat request!! For the last year, we have just been making hats and characters that we think people would enjoy, and that’s included Minions, Mike & Sulley from Monsters, Inc., Hello Kitty, Cookie Monster, The Grouch, bunnies, chicks, footballs, apples, gingerbread people, snow people, pumpkins, Frankensteins, frogs,dogs, dinosaurs, hippos, Elmo, cupcakes and pirates. But through Facebook, from our new friend, Malachi’s mommy sent us a request. We learned Malachi is a young 3 1/2 year old boy who was born with HRHS (Hypoplastic Right Heart Syndrome), which is a rare congenital heart defect. The American Heart Association reports that approximately 36,000 babies are born each year with some type of heart defect. Growing awareness has helped to give parents easy access to information about congenital heart defects. Hypoplastic Right Heart Syndrome, however, remains one heart defect with limited resources available online. Malachi is scheduled to have heart surgery in June, and we pray for a quick recovery and wonderful news. If you would like to support this young warrior, please visit his Facebook page to read more about “Mallie”, as his parents lovingly call him. Please tell them that Knitting Rays of Hope sent you to pray & support this young boy and family in facing CHD (Congenital Heart Disease). When we started this last year, we actually worried that we would get requests for hats that we couldn’t make or become so inundated, that we would be behind constantly. And it took a little over a year, but we were so excited when we received Malachi’s request, though we have never made a sock monkey before. MMMM. Off to the greatest place of inspiration, Pinterest. 🙂 Search Sock Monkey Hats. 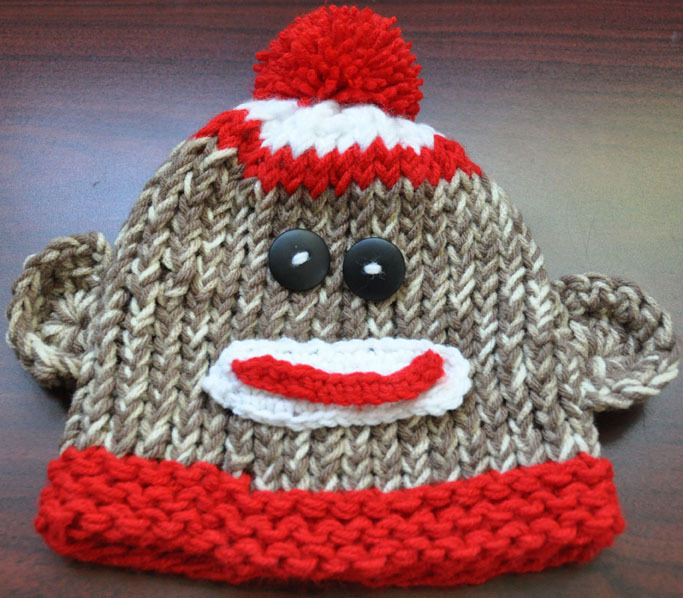 The pattern I used for this Sock Monkey is pretty basic; the brim is a garter stitch for 6 rows, the rest of the hat is e-wrapped. For the face, I used 2 yarns, one was a light brown and one was a variegated cream & tan. I crocheted the ears and an oval for the white part of the mouth and 2 chains for the red smile. Vanessa helped me by making a great big red pom-pom and sewed the eyes, ears and smile onto the face. We are very please with how it turned out. I think it looks great on Mallie and sincerely hope he loves it. 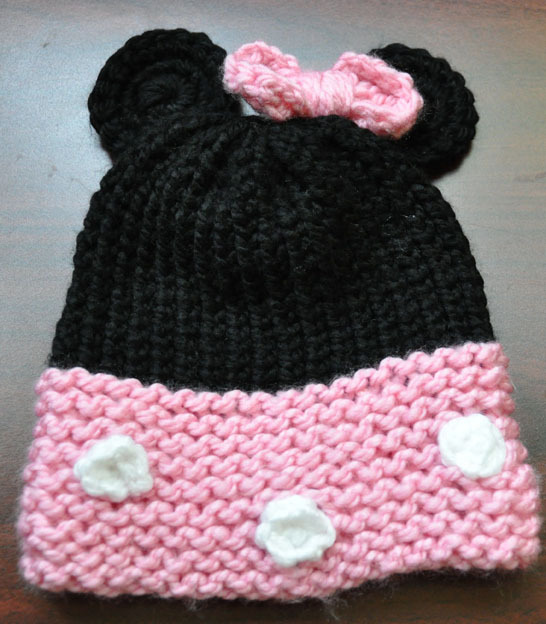 This hat brings our totals to 550 hats created & sent! Since our 1st hat request, we have received quite a few more and we are excitedly planning, working and making them. We hope that these hats bring humongous smiles to these children’s faces! We immensely enjoy receiving the pictures with such cuties wearing hats we made with love for them. 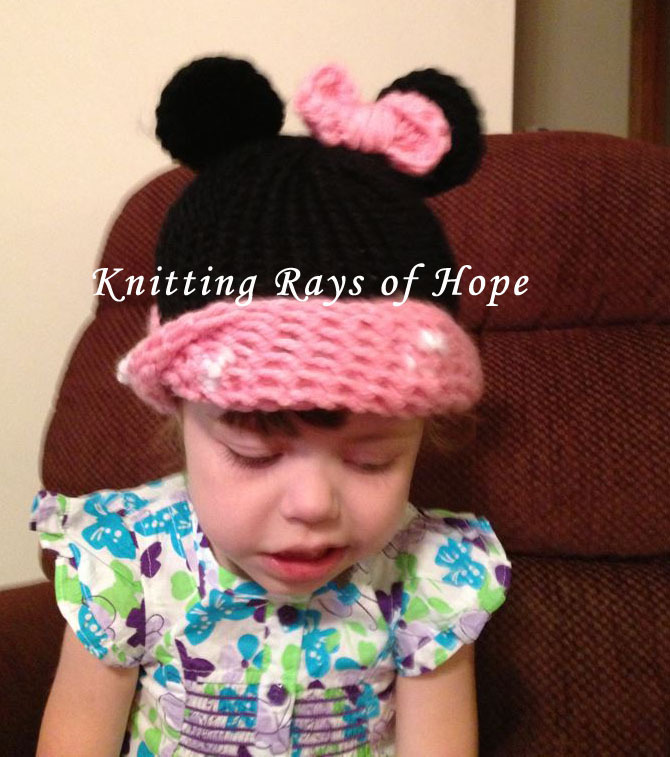 If you would like to request a specific hat be made for you or a loved one fighting an illness, please “Request a Hat” button on the right side under “Contact Us” or you can connect with us via Facebook. Hope you have a splendid day!